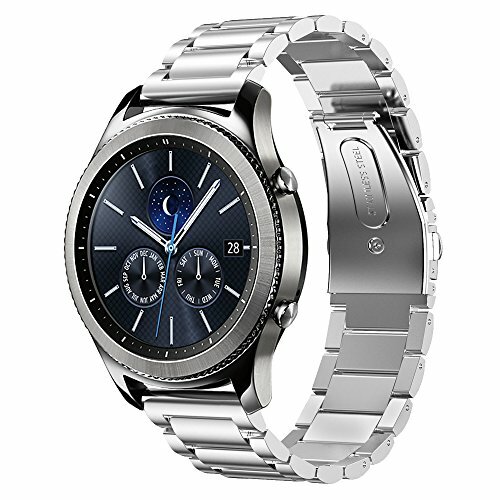 Custom designed for your Samsung Gear S3 Classic SM-R760 / Frontier SM-R770 Smart watch, alao fit for any smart watch with 22m frame such as Pebble Time / Steel, Samsung Gear 2 R380 R381 R382, Moto 360 2 46mm, LG G Watch W100 W110 W150, ASUS Zenwatch 1 2 Men Ect. Band comes with quick release lugs on both ends, which locks onto Watch Band Interface precisely and securely. Super easy to install and remove. Adopts double button folding clasp, firmly closed, and prevent loosen automatically, easily to take on / remove, safe and beautiful. Fits 5.5"-8.5" (140mm-215mm) wrist, contact us to get extra links if you have big wrist.